As the blind woman (whom I’ll refer to as X) sat down beside me, I took a glance. X looked like she was in her 50s with a cheery disposition. Curious to know her story, I struck up a conversation. “On your way home?” I asked. “I see. Which stop are you alighting?” I asked, thinking of helping her to keep a look when the stop comes. “Oh, I’m taking the bus all the way the interchange,” she said. This meant that she was alighting at the final stop, so there wouldn’t be a need for me to help her watch out. “I see,” I replied with a nod. “Well, I’m alighting before you, at Bukit Panjang. I live at YYY; I still need to walk a little after alighting to get home,” I continued, deciding to share my personal information as a way of connecting with her. X is a masseuse; she has been so for the past 10 years. She used to be able-sighted and only became blind in her later adult years, probably in her late 30s to early 40s (she didn’t explain why she became blind; I didn’t ask). After she became blind, she approached the Singapore Association of the Visually Handicapped (SAVH) and picked up new skills as a blind, including massaging. She worked for SAVH for a while before switching to a commercial massage company as they have a higher pay. As her company is in the town area, she commutes daily to work by bus, for about an hour each way. She travels without assistance, save for her walking stick and the occasional Samaritan to help her look out for the bus. Her husband cooks dinner and waits for her to reach home before eating in every day. As I listened to X’s story, I was amazed. 残而不废 was what I was thinking the whole time — I even said this to X. It’s a Chinese saying that means that disability doesn’t mean uselessness. While X is visually handicapped, it hasn’t stopped her from being of value to the society. She proactively approached SAVH to learn new skills such as massage and used that skill to gain employment, thereby making herself an asset to the society and able to earn a living for herself despite her condition. You are not alone in your problems. Sometimes, being stuck in a predicament can make us feel like we’re alone in our problems while everyone is out there having a great life. This is nothing more than a false belief though. Everyone faces problems — and chances are there are people out there facing the exact same problem as you are, perhaps even worse than what you are facing. Don’t feel that you’re alone because you never are. Your problems are only as big as you make them out to be. I don’t know how many people I know who can lose their sight and still be positive and be proactive about living. Probably less than five. Sight is one of my most treasured senses, and it’s one of my greatest fears to lose my sight one day (touch wood). I’m sure it’s the same for others. Yet for this blind lady, she exudes an optimistic persona despite having lost her sight — and she used to be able-sighted. It’s not like she was born blind, in which case she would have no comparison point as to how life with sight is like. She refuses to make her issues bigger than what they are, which is why she is still happy despite being blind. What problem are you facing now? Are you making them out to be huge issues when they can be logically worked out with time and patience? As I always say, happiness is a state of mind. Don’t give more weight to your problems than they deserve; to do so would be to exhaust yourself. Be grateful that things aren’t worse. No matter how bad things are now, they can always be worse, trust me. The fact that you are alive, with (I assume) a roof over your head and internet access (in order to read this article), means that you are much better off than a significant portion of the world’s population. While that may seem surprising, it isn’t. Do you know that 50% of the world’s population lives on less than $2.50 a day? That 80% of the world’s population live on less than $10 a day? And that 22,000 children die each day due to poverty? (Source: Statistic Brain.) How much did you spend on your last meal outside? Probably more than $2.50. Mine was $4 USD: a Subway Veggie Delite sandwich and drink. Sometimes, it’s hard for us to realize that many people out there are worse off than us because we’re surrounded by supposedly richer, better and happier folks. This isn’t true though. We are truly much better off than many people in the world. So, chin up! Be grateful for the problems that you get to face, because they remind us of how good our life really is. Act on your problem. After X became blind, she didn’t resign herself to a life of nothingness. Rather, she looked up SAVH and took classes there. She picked up massaging as a skill. After that, she became a masseur and achieved gainful employment. If your problem is making you unhappy, then act on it. What changes your problems isn’t the feelings that you harbor, but the actions you take to address them. Identify what can be done to fix things, and act on them. Don’t mull in your problems because doing so will be to give them weight. Let go of the things that can’t be changed. Sometimes there are things that can’t be changed no matter what you do. For example in X’s situation, she can’t change her blindness. 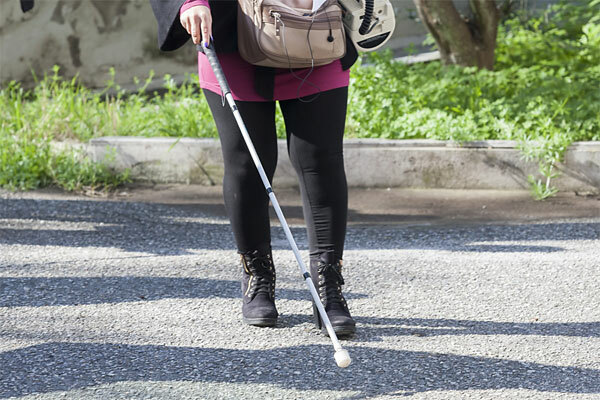 So, she focuses on the things that can be acted on — picking up skills as a blind, making herself employable despite being blind, and not being a liability on her family. For the problem you are facing, what are the things that can be changed? What can’t be changed? Focus on the things that can be changed; let go of the things that can’t. The more you hang on to that which can’t be changed, the unhappier you’ll be. The more you act on the actionable items, the more empowered and happier you will be. Focus on giving. During our conversation, I was amazed at how selfless X was. Since X is working in a massage company, I was interested to learn more about her company and possibly get a massage under her, as a way of supporting her. (She gets a variable pay, so the more customers she serves, the more she earns.) However, rather than “sell” me about her company and massage service, she kept telling me about the massage service by SAVH and encouraged me to get my massage there, so that the blind employees can earn some income. I believe that’s because she used to work at SAVH and she knows how low their pay is, so she just wants to help wherever possible. When you are facing a problem, does your attention shift to focus on yourself, or do you still show care and concern to others around you? Sometimes I can get engulfed in big issues, but I always remind myself to never neglect the people I care about and the people out there whom I’ve pledged my life to serve. Similarly for you, never forget to care for others no matter how bad things are. You’ll be much happier and abundant that way. You create your future. X was working at SAVH for a while, but her pay was minimal since it is a non-profit and the massage fees are low. She then sought out commercial massage companies for employment. Now, most companies will never consider hiring the blind, but she eventually found one that accepted her. She has since been working there for 10 years and counting. If X had assumed that the commercial companies weren’t going to employ her, she would have stuck to working at the blind association and not ventured out to seek employment at those companies — which would have in turn made this a self-fulfilling prophecy. The reason why she managed to get a job with a better pay was because she asked. She made things happen.